Ajax winger Justin Kluivert will have a medical with Roma on Tuesday, before completing a move to the Serie A club. The 19-year-old, who is the son of former Netherlands striker Patrick, was pictured arriving into Rome Fiumicino airport on Monday night. Kluivert hit 10 goals in 30 appearances last season and won his first senior cap for the Netherlands in March. 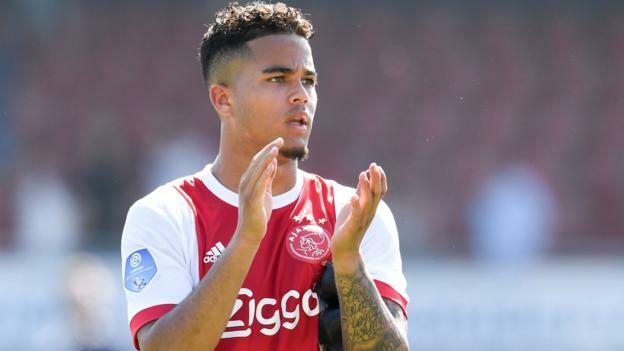 He made his Ajax debut in January 2017 and scored his first senior goal just two months later. The player, who had been linked with Manchester United, will sign a deal worth a reported 20m euros (£17.6m) with the Champions League semi-finalists. Kluivert, who came through the Ajax academy and has represented his country at various age groups, is following in his father’s footsteps in moving to Italy. Patrick Kluivert played at Ajax between 1994 and 1997, winning two Eredivisie titles and the Champions League. He scored 39 goals in 70 appearances for the club before going on to play for AC Milan and Barcelona in a 14-year career.